It is estimated that 15 percent of strokes are a result of untreated AFib. While AFib can occur at any age, it is more common in people 65 years and older and in people with high blood pressure, heart disease or diabetes. There are various ways to treat AFib depending on factors such as the type and severity of the patient’s arrhythmia, prior treatments and other medical conditions. Treatments include lifestyle changes, medications (to slow the heart, control its rhythm or reduce the risk of blood clots that can cause strokes) as well as catheter-based ablation procedures and surgery. With catheter ablation, an electrophysiologist inserts a thin flexible catheter, with an electrode on the tip, into the neck or groin steering it into the heart. There are three technologies for catheter ablation: radiofrequency; cyro; and laser. “We are very proud to say that we were the first hospital in Louisiana and the Gulf Coast to use the CardioFocus laser balloon,” Dr. McKinnie says. Ablation is performed by applying the catheter to areas that are likely to be the cause of the arrhythmia, creating a scar that will discontinue the electrical impulses that cause AFib. In catheter-based ablation procedures, the pulmonary veins are targeted. Although these techniques are usually effective for treating early forms of AFib, known as paroxysmal (intermittent) atrial fibrillation, it’s less effective at treating persistent or permanent forms. The Convergent procedure combines the best aspects of arrhythmia surgery and pulmonary vein isolation in one operating room. A team including cardiac surgeons and electrophysiologists will work together to first cauterize the posterior wall of the heart and ablate the pulmonary veins by either freezing or burning it to interrupt triggers causing the atrial fibrillation. East Jefferson General Hospital is one of the very few centers offering the Hybrid Convergent procedure. EJGH started this program in 2011 and currently has completed more than 330 cases to date. The Hybrid Convergent team consists of cardiac surgeon, Dr. Mike Brothers, and electrophysiologists, Dr. Zhen Jiao and Dr. James McKinnie. When the 100th Convergent Hybrid procedure was performed in 2013, EJGH earned its place in the top five hospitals in the United States for this milestone and pioneering procedure. Remaining on the cutting edge of technology, EJGH is the only hospital in the Gulf South with the state-of-the-art Rhythmia Mapping System. This system allows electrophysiologists to focus in on the potential source of dysrhythmia. By utilizing a mini-basket catheter with 64 electrodes, arrhythmia can be mapped with extremely high precision. 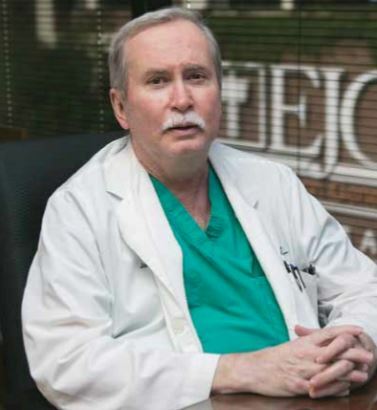 “We now have the tools to go after irregularities that in the past, we may not have pursued,” Dr. McKinnie says. Approximately 850,000 people are estimated to have AFib and remain undiagnosed. A full quarter of adults over age 80 will develop at least one AFib episode in their lifetime and many will be chronic. Someone with AFib may or may not experience symptoms. Symptoms may include fatigue, a rapid heartbeat or shortness of breath. High blood pressure, obesity, sleep apnea and stress may exacerbate the condition. Caffeine, alcohol (especially binge drinking) and nasal decongestants are also tied to AFib.